You have probably heard about Joost, one of the popular Internet TV clients that made the rounds in the blogosphere for a while. I hardly hear about it anymore. Joost was proprietary and had about 250 channels. Did you know that there is an open source alternative that has about 2500 unrestricted channels? Yes, I said 2500! 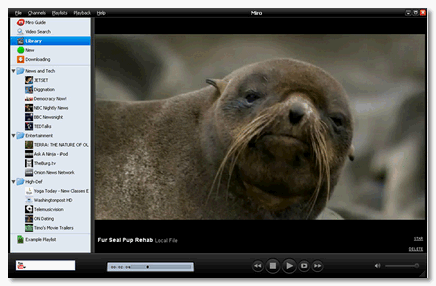 Miro is the open source version that is free and can turn your computer into an Internet TV. It is loaded with numerous features and a built-in bittorrent client that touts faster downloads. Let’s check out some of the impressive features that make up this hard to ignore piece of open source software! Throw any video format and it plays – MPEG, Quicktime, AVI, Divx, Flash video, H.264, gp2, Flash video, Windows Media to name a few. If you are a RSS feed junkie, Video RSS feeds will be natural for you. 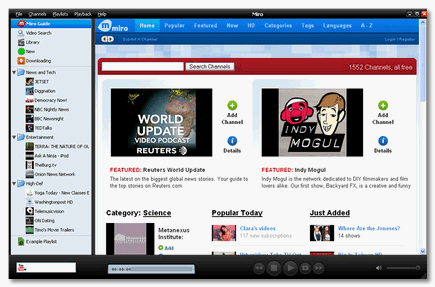 Miro can search and download from all major video sites like YouTube, Blip, Revver, DailyMotion etc. Create search within a channel – soft of a keyword filter in RSS feeds. For eg. watch just ‘pingpong’ videos in a sports channel. Import/Export Channels as an OPML file just like you would export/import bookmarks in your browser. Miro 1.1 just released with some of the above features just included in it. I was overwhelmed by the maturity of this video player and the full blown features it offers. You can find detailed descriptions of all the above features in Miro’s features section but I have listed most of them here so you don’t have to click over. It works great in all 3 major operating systems – WIndows, Mac & Linux. And it has a beautiful and intuitive interface. While installing Miro, it offers to install a Firefox Extension ‘I Heart Miro’. What this extension does is to donate a small amount to the Miro open source project anytime you purchase something from Amazon. When you are not paying for it so why not help such a cool software by having that extension installed? If you were feeling generous, of course you always make a direct donation to the project. I can’t believe it’s been almost a year since I wrote this Miro review. Miro 2.0 has been released and sports a lot of new features. I like it. I was a beta tester for Joost…never liked it. In fact I unloaded it. Hey Troy, that is pretty cool too! But, Miro has a lot going for it, imho. digitalnomad, I beta tested Joost too but never went back to using it. It was long gone for me too.. but I can see Miro taking a permanent seat for me. I never actually liked Joost . Was resource consuming. How is Miro in terms of resources. This is a great write-up of Miro — love to hear that you’re so happy with the software! Please e.mail me if you have any direct feedback you’d like to give us. I just wanted to remind you that we’re not really competing with blip.tv. Blip and Miro really compliment one another (they are one of our all time favorites!). If you’re ever publishing video, blip is a great place to do it. Dean, I voice strongly for any product that has the quality and of course I love open source. I am sure I will have feedback to offer as I usr Miro, more and will absolutely be happy to do just that. Thanks for stopping by and taking the time to chime in, in the discussion. Cheers! Great post. I added you to my blog roll! I was searching for reviews on Miro and found a good one here by you. I was thinking of giving it a try so wanted to know how good it is before I actually use it.